Heaven is born of activity and Earth is born of tranquility. The interaction of activity and tranquility gives full development to the Way of Heaven and Earth. At the first appearance of activity, yang is produced. As activity reaches its limit, yin is produced. The interaction of yin and yang gives full development to the functions of Heaven. At the first appearance of tranquility, the element of weakness is produced. When weakness reaches its limit, the element of strength is produced. The interaction of these two elements gives full development to the functions of Earth. Greater activity is called major yang, while greater tranquility is called major yin. Lesser activity is called minor yang, while lesser tranquility is called minor yin. Major yang constitutes the sun; major yin, the moon; lesser yang, the stars; and lesser yin, the zodiacal spaces. The interaction of the sun, moon, stars, and zodiacal spaces gives full development to the substance of Heaven. Greater tranquility is called major weakness, while lesser tranquility is called minor weakness. Greater activity is called major strength, while lesser activity is called minor strength. Lesser weakness constitutes water; major strength, fire; lesser weakness, earth; and lesser strength, stone. The interaction of water, fire, soil, and stone gives full development to substance of Earth. 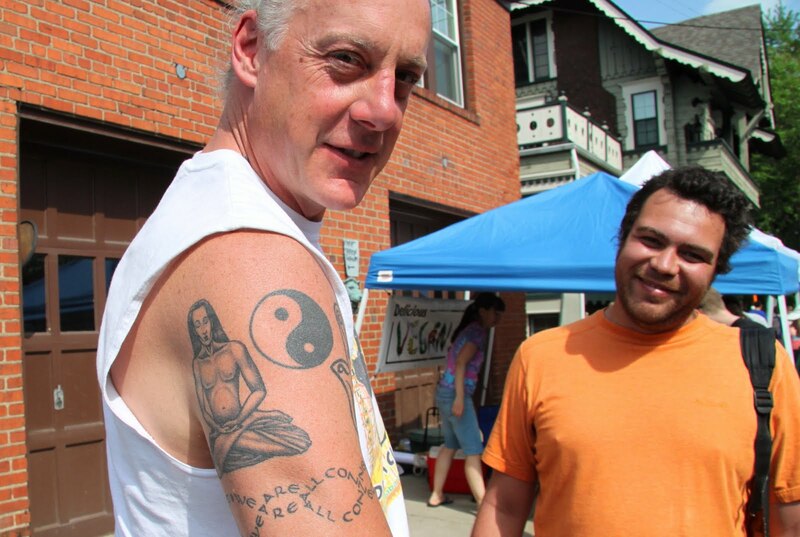 the human canvas for today's body art is a fellow named paul - i met paul at this year's hessler street fair. in addition to the yin and yang, paul's arm include is a buddha figure in a yoga position, a band with the message "we are all connected" spelled out in a double helix pattern, and what appears to be an interpretation of the hamsa hand. The tattoos are amazing! Never really read anything about Yin and Yang, thanks for sharing it! I do so enjoy travelling through the alphabet with you. The letters are, of course, predictable : the images and the words never are. You introduce us to the most interesting people! I've just got to get a tatoo. Life & The Eternal Balance.Y-Not!? I love that "We Are All Connected" tattoo -- very interesting. Now THAT's a tattoo I could see myself getting. Kim, you have such courage in asking strangers to pose for you. I wish I could do that.